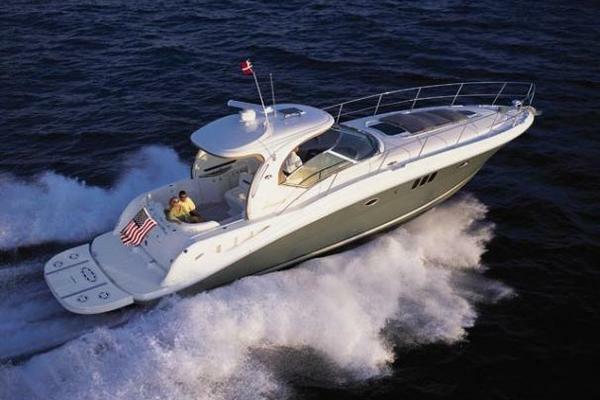 The 546 Yachtfish was introduced on a custom limited-production basis. The three stateroom interior boasts a full beam master, a newly renovated galley in 2017 with home size appliances and a stand up engine room. The Sky-lounge is fully air-conditioned and had all its soft goods replaced in 2017. She spent her first 10 years in Wisconsin and averaged less than 80 hours per year and was always stored for winter. Over $80,000 spent in 2016 and $40,000 spent in 2017 in upgrades and continual professional top level maintenance. 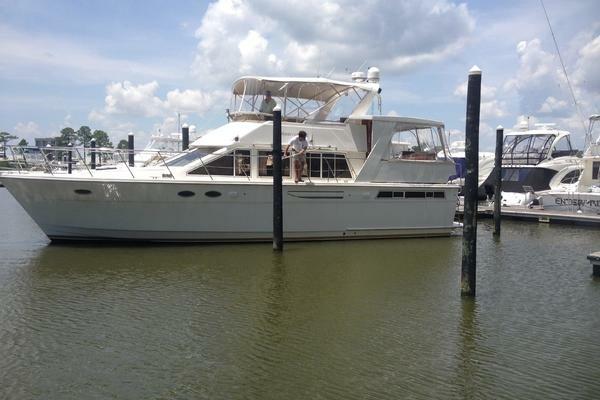 Lady Debora is a modern tri-level cockpit yacht whose versatile layout and spacious accommodations are well sited for cruising and entertaining. Sitting dockside the vessel can be easily boarded by the port and starboard midship boarding gates. A starboard side wing door provides quick access to the salon. The wide cockpit gunwal also allows easy boarding along with a large swim platform which makes easy access by the yacht tender. The generous cockpit features a varnished cap rail, teak sole, built in boarding steps, and all the features needed for a day of fishing or diving. The huge lazarette allows for storage of Bulky items and houses the generator. Three steps up from the cockpit brings you to the large aft deck. This area is as large as comparable vessels in the 80 foot range. 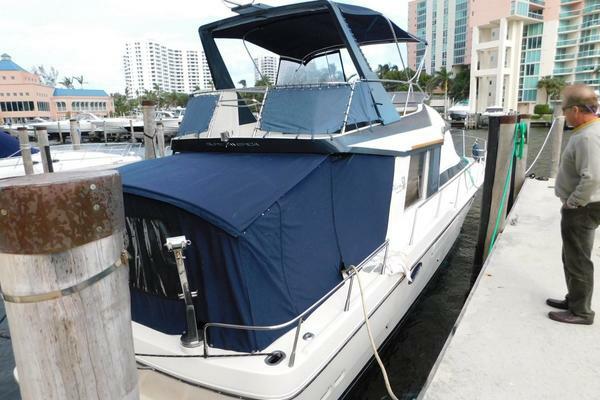 The fiberglass hardtop completely covers the aft deck and provides protection from the sun's rays. Port and starboard forward wing doors provide wind protection and give quick access to the side decks. The sizable wet bar boasts a refrigerator, ice maker, sink, storage cabinets and a drop down cabinet for a TV. The central pedestal table allows dining for eight. The new Wicker settee adds elegance and the teak sole provides sure footing underway. While underway or at anchor dining the captain and crew will enjoy the view from this excellent raised vantage point. Five steps up from the aft deck brings you to the spacious sky lounge. Huge tempered windows all around provide an unobstructed 360° view of your voyage. A vast array of mechanical and navigation aids makes your adventure a breeze. All new upholstery for the bench seats, settee, and helm seats give a fresh look. The forward center window, side windows, and aft windows all open up for fresh air underway. Closing all the windows and activating the central air conditioning makes the hottest day a pleasure. The aft bridge deck houses the tender, davit, life raft, bicycle brackets, and quick access to the hard top. Stainless steel hand rails and a non skid sole protects the crew. The bow boasts a Maxwell windlass, welded stainless steel handrail, spare anchor, boarding ladder and non skid sole. Three steps down from the aft deck ushers you into the recently renovated salon. Immediately to port is the galley with new custom cabinets and granite countertop. Other items include home size appliances, double stainless steel sink, bar stools, and a parque sole. Forward of the galley is the dinette with a newly recovered sofa. A high low table makes a cozy place to dine while still allowing you to see your surroundings through the large cabin windows. New curtains and exterior sun covers keep things cool down below. A sliding door to starboard allows for quick access to the side deck. The overhead is a light vinyl with newly added LED lighting. The newly fitted carpet feels great to walk on and all the new soft goods and professionally decorative appointments look like a pic from Show Boats International. The forward companionway provides access to the guest cabins. The VIP is all the way forward with two large berths. All new soft goods look elegant. Other highlights include vanity with swing out stool, abundant storage, stainless steel port holes, new carpet, and a private door to the head. The second guest stateroom is to the port side of the forward companionway. The two single over under berths have all new mattresses, new covers, and accent pillows along with new carpet. This cabin also features private head and shower, abundant storage and accent lighting. The stand up engine room can be accessed from the second stateroom shower stall. Preflight checks of the engines are easy with all the space and upgraded lighting. A continuous maintenance plan has kept all systems ship shape. The master stateroom is all the way aft and has a private companionway. There is a washer and separate dryer outside the doorway. The master is a full beam. The large island queen berth boasts a new Posturepedic mattress and all new soft goods. Custom decore, book cases, abundant light and new carpet make you feel at home. Plentiful drawers, closets, cabinets and hatches allow plenty of storage for an extended journey. The in suite head features a beautiful large vanity mirror, Vacuflush head system, and large shower stall.